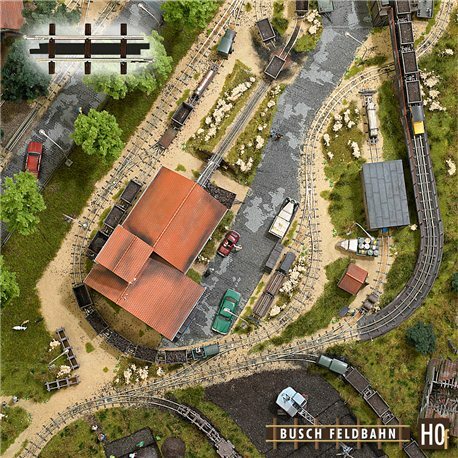 The scale field railway track system in the track width of 6.5 mm (equivalent to approximately 600 mm in the original) is a completely new development. The tracks have the usual at railways large distance between the cross ties. The special feature of these tracks are integrated metal strips provide the required, magnetically elevated pressure of the locomotives. The current consumption between the wheels of locomotives and the rails is improved in this way and allows a prototypically slow and smooth ride at high torque. The new field Railway tracks are therefore suitable for the mining railway Busch. The track system offers many variation possibilities for various track plans with varied driving conditions and is well matched to the bushveld train bridge system.